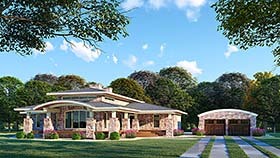 Timeless design is paired with stunning modern elements to set this house plan apart. Full brick siding is complimented by large tapered columns and an arched front porch. Make your way indoors where you can head into the Parlor to enjoy a cozy fire. The Kitchen is conveniently tucked between the Parlor and the Dining Room giving a mirrored effect on the floor plan. On the left side of the home you'll find the Master Suite as well as bedrooms 2 and 3. Head back towards the foyer and you find that the left side of the home contains Bedroom 4 which can double as an office space if needed, the spacious Laundry Room, a walk-in pantry and a hall closet.